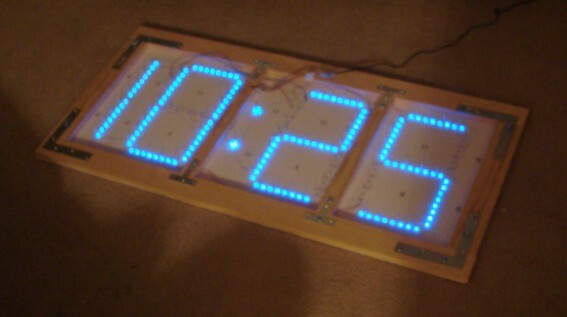 This four foot wide clock uses 192 LEDs powered by a single ordinary LEDkit™ driver. No other electronic components are required! Read the press release. The 192-LED kit is custom order only. You can make it by ordering a standard kit plus extra LEDs (order here). Then download the drill pattern from here. Replace each group of two LEDs in the standard diagram by eight LEDs. That's all there is to it! Multiple displays can be linked together to show the same time. Just wire several displays in parallel to a single driver as explained here. It is possible to make a smaller display by removing half the LEDs. Thanks to Mark Wilson for sharing this DMM clock story .